I'm happy to announce that the City of Santa Rosa has agreed to cooperate with Homeless Action! 's Homeless Legal Services Project in the full release of the infractions issued by its Police Department since January 1, 2016. Together with the records from the City's Arrest log listing misdemeanors, the Project can now research the history of what the City has called "Quality of Life" offenses. Homeless Action! has also submitted a Public Records Act request to the City to obtain a copy of the Memorandum of Understanding (MOU) between the City, District Attorney, Public Defender, and Probation which the City Attorney announced in August was being developed to implement a set of procedures in which those charged would be prosecuted. A future post on this blog will detail what we have found, and what we are doing to minimize the criminalization of our homeless residents. First of all, thank you so much for your support of and advocacy for our shelterless residents. To give you a little bit of my perspective, I just want you to know that Margaret and I have been in near-constant communication since the camp relocated to Roseland. I’m looking forward to opening up the lines of communication with you and other community advocates and camp leadership as we chart a path forward. I visited the village last Thursday and spoke with New York, the camp secretary (Debbie, I think? ), SRPD and business owners. I recognized the complete inadequacy of existing infrastructure to serve the new population of residents. Thank you for your offer of help. I will be honest — I am also concerned about the location, and the fact that the social challenges downtown Santa Rosa was facing have essentially been shifted into the vulnerable community of Roseland. I’d like to convene a meeting with you, Margaret, Adrienne, and whomever else would be appropriate to invite as we look towards sustainable solutions for the crisis we find ourselves in. I’ll be in Sacramento most of this week for the annual California Association of Counties conference, so we are looking at possibly Dec 1, or next week for a meeting. Let me know if you’d like to meet, and if so, who else should be invited. Thank you for your engagement here, and for your willingness collaborate on solutions. We at the county are working to develop a productive strategy for this situation, and will certainly look to talk with you about options in the coming days. We have decided to make a short-term investment in portable toilets and hand washing stations while we develop a plan, and Benjamin Wickham, who has assumed some of Jim Leddy's responsibilities at CDC, will be working to secure those and have them delivered as soon as possible. We do not need to utilize Mr. Fearon's donated funds at this time, though the offer is much appreciated. We also plan to work with the City, the HOST team, and others, to redouble our efforts towards housing placement services, and will wish to coordinate any such efforts in that regard with you as well. I will plan to be back in touch shortly as I'm able to connect with other county and city officials to understand the range of short-term options available to us on this redevelopment site. I am writing to discuss collaborative efforts on behalf of the homeless tent village set up just outside of Remembrance Village behind the Dollar Tree Store. I worked closely with Jim Leddy when Mikeal O'Toole and I established RV (then known as Camp Michela). I would like us to work cooperatively, but must stress that I cannot provide the oversight I did originally. Nonetheless, I hope we can address their concerns quickly and effectively. I provide a short summary of the most immediate needs below. - cover the costs of the first portapotty once private funds are depleted. - provide access to water. Ideally, the water hookup for the weekly shower truck for RV could be turned on, fitted with a spigot, allowing two hoses to run from it, one to RV and one to the new tent village. Hoses would be fitted with on/off values to avoid water wastage. We used this system successfully at the Sonoma County Water Agency, when Camp Michela was located there. I will be glad to provide regular updates about the new tent village. Thus far, we are establishing a camp council, volunteers are providing trash barrels, and a short span of fencing has been set up to designate where tents are permitted. Most of the residents would prefer an enclosure with a covering for privacy and safety. We are keeping a wide lane open to ensure entry and egress for fire, police and ambulance between the two villages. Additionally, tents are a minimum of three feet apart. A gate in the fencing will allow ease of use for the RV residents. But, we need the gate. We have found that allowing the homeless residents to establish their own governance works the best in the long run. All residents in the new village have been (or will be) required to sign a contract agreeing to abide by the rules established orignally for Camp Michela, and agreeing to leave if they refuse to abide by the rules. I look forward to a chance to discuss these issues with you further. Last night, the Santa Rosa City Council continued its efforts to arrive at solutions for the enormous homeless encampment and safe parking needs of its residents. In the discussion of options, it heard from staff that the County had been exploring renewing its support of safe parking locations. Kelli Kuykendal corrected her staff report, saying that her latest information was that the County had decided not to pursue safe parking at this time. Members of the audience who have attended CDC meetings indicated that the County may not have closed off the discussion, but wee delaying it for more study. The Council asked for clarification of the reasons for delay, and I expect Kelli will call you to help her prepare an answer which helps facilitate the forward movement of the Council in partnership with the County. Homeless Action is interested in partnering with the CDC in any ways that we can in support of the development and operation of safe parking sites. If any planning meetings are held in which you feel that our participation would be helpful, please contact me. On Tuesday, November 21st, the Santa Rosa City Council heard a report from its City Manager that its activities to evict the homeless from the City's underpasses encountered problems. "Outreach efforts were impeded by interference from activists. Consequently, many of the occupants vacated the area rather than being placed into services and shelter, including a group which has relocated to Roseland Village (Camp Michela aka Remembrance Village)." “I was present the morning HOST did the intake interviews. The man there working for them dropped his clipboard and some cards or paper right in the middle of the street (left turn lane) as traffic was oncoming, and I offered to help. I got rudely barked at for the offer, so I walked away. Later, when one or two of them were at a corner (6th and Morgan) waiting for their colleagues to walk a block or so and join them again, someone asked if they could see a blank intake form to know what questions were being asked. This request was denied, and the requester did not press. The next day when HOST was picking people up to go to the shelters and waiting for residents to get their stuff ready, I asked one of the women working for them a couple of questions after she was done talking to a resident: how many beds were available, and—after she claimed not to know—what their plan was if they transported people to a shelter and those people were turned away at the door. I was told there were more than 8 beds, but she didn't know how many more, and they "could fill some extra space with cots." She didn't know if there was room for 15 people. She didn't know if there was room for 10. That was it. This back and forth probably took 30 seconds to a minute, and she was standing around waiting so it's not like I was holding her up. That is the full extent of "interference" I am aware of. I and several others I talked to stayed away from HOST as they conducted interviews, both to respect residents' privacy and confidentiality and fully hoping that as many people who could and wanted to would get through the process and into a shelter. I believe HOST was present for all of 45 minutes to do their interviews the first morning (far less than that when picking people up the second morning), and nothing we did caused them to pack up and go home at the end of that. To the best of my knowledge they did not visit 5th Street. Personally I was there to observe and record the whole process (especially the role of the police), get people food and essential supplies, help them pack and move things, and raise some awareness by displaying signs for passing cars and people. I was not there to interfere with HOST in any way, nor would I have supported anyone else doing so. By the way, those arrests that supposedly happened for reasons unrelated to the encampment happened while people were being detained for reasons related to the encampment. For example, they detained people who they said they suspected were not giving their real names, and at least one arrest proceeded from there. If these people had just been walking by on the street, they almost certainly would not have been targeted, detained, or arrested. Saying the arrests had nothing to do with the encampment is complete fiction. I am investigating the charges that activists interfered with HOST or the police or any other entity participating in the evictions as well as the transport of people and possessions to the new sanctuary camp next to Camp Remembrance in Roseland. Personally, I witnessed no interference nor complaints from any of the above about such allegations. The one exception is that Sgt Jon Wolf told me that an activist was hovering too closely near the Mental Health Unit, which had been called and was assessing somebody [not sure if that was at 6th St or Roseland]. I'm going to be speaking with all the parties quoted in the PD piece by Kevin McCallum, including Kevin, and I intend to set the story straight. I already have a long list of the myriad forms of invaluable assistance that we provided and it is my contention that we were not obstructors, we were protectors. If anybody has any further information of any sort about encounters, particularly with woman who appeared to be the captain of the HOST team, please let me know asap. This notice announces a homeless encampment eviction in Santa Rosa next Tuesday. The Santa Rosa Police Department will be enforcing local and state laws including but not limited to the following. Violations may result in the arrest and booking into the Sonoma County Jail. Santa Rosa City Code Section 10-12-020 - Obstructing tunnel, overpass, etc. No person shall loiter in any tunnel, pedestrian subway, or on any bridge, overpass or at or near the entrance thereto or exit therefrom or at or near any abutment or retaining wall adjacent to such entrance or exit, or any retaining wall or abutment adjacent to any freeway, street, or highway open and used for vehicular traffic, or adjacent to that portion thereof used for vehicular traffic, or on any public property in the proximity of such bridge, overpass, or retaining wall or abutment. Santa Rosa City Code Section 10-12-030 - Obstructing tunnel, overpass, etc. No person shall sit or lie in or upon any street, sidewalk or other public way in such a manner to reasonably prevent, delay, hinder, obstruct, or interfere with the free passage of any other persons. Santa Rosa City Code 10-04-010 - possession or consumption in public place. It is unlawful for any person to possess an open container of or to consume beer, wine, or other alcoholic beverage at any time on any public highway, road, street, sidewalk, lane, alley, mall, planting area, City-owned parking lot or parking building, or within Old Courthouse Square. Santa Rosa City Code Section 10-08-010 - Public excretion. It is unlawful for any person over the age of 10 years to willfully urinate or defecate in a public place or in a place exposed to public view. Santa Rosa City Code Section 9-12-050 - Littering. It is unlawful for any person to litter, dump, throw, or otherwise deposit or accumulate or cause to be deposited or accumulated any solid waste, recyclable materials, yard trimmings, household hazardous wastes or other hazardous wastes, garbage, debris, or other wastes in or upon any vacant lot, or in any backyard, or in or upon any highway, street, alley, gutter, sidewalk, park, waterway, or other public place within the City. All personal property and debris must be removed immediately or it will be removed by the City of Santa Rosa on or after November 14, 2017. Any items that pose a risk to public health and safety will be disposed of promptly. Other personal property will be stored by the City of Santa Rosa for a period of 90 days. If your personal property has been removed by the City, you may contact the Santa Rosa Police Department at (707) 543-3618 for information on retrieval. Failure to claim and retrieve your property may cause it to be considered intentionally abandoned. Unclaimed property may be disposed of after 90 days per California Civil Code Sections 2080 - 2080.10. “Homeless Talk” existed to engage our community in conversation regarding homelessness in our city with no 'Homeless Talk' bias, judgment, opinions or specific agendas by the organizers. Our aim and commitment was to take your community voices and present them to the public, in the hope that they will influence positive and concrete solutions. We invite you to review this report and, if interested, delve into the actual data collected and presented in Appendix 2. Make your own analyses from the many comments we collected. If you would like the raw data in a manipulate-able spreadsheet, contact us. This report is our gift to our community, in honor of the many people who are living without a home and, like many others, working to end homelessness in Santa Rosa. We are grateful to http://sonomacountyhomeless.org/ for hosting our report on their website. Here is another link to the Homeless Talk Summary Report. Here is the link to the whole Homeless Talk Report. Our project produced many recommendations from participants. We’ve categorized some of the highlights below and invite stakeholders to choose any of them to pursue. Based on our analysis of the conversations, the steering committee has created some action steps. The Participant Conclusions below are ideas that came from one or more Homeless Talk conversations. The Steering Committee Action Steps sections are the product of over a year of work attending, analyzing and thinking of practical implementations for the participants’ ideas. • There is an untapped reservoir of goodwill and a desire to help homeless people and/or end homelessness in Santa Rosa. Although some people see simple ways to solve homelessness, most see it as a complex issue similar to poverty, healthcare and housing. • Even prior to the October fires, a significant number of Santa Rosa residents, possibly for different reasons, believed that the situation around homelessness in Santa Rosa is unacceptable. There is strong public support to change the status quo and adopt new housing strategies. * People suggested a monthly dashboard on the city website and in local media showing the number of people who are unhoused, newly-housed and other crucial facts about the progress of ending homelessness. • People see a role for churches, community groups and collaborative efforts. They reported a significant amount of effort and encouraged others to help individual homeless people, as well as to join organizations: to work in food pantries, the nomadic shelter and regular meals. • Because transparency is a critical aspect in finding solutions that will achieve community support, we encourage the city to implement the Open Government Task Force Report of 2015. We applaud the city’s improved website and encourage them to continue this expansion. 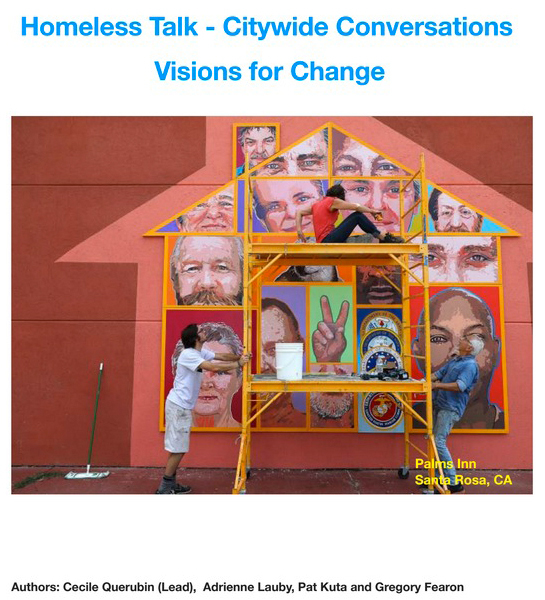 • We encourage the City to budget for the creation and support of neighborhood organizations which could provide regularly held “city-wide conversations” on homelessness, post-fire planning and other issues. This network would allow grassroots and volunteer groups to routinely achieve a broader city-wide dialogue when important issues arise. • Some organizations bring particular expertise with under-served populations of unique needs and challenges. “VOICES”, a center for marginalized transition-age youth, builds strong support for youth and builds leadership capacity. The “Interlink Self-Help Center” works peer-to-peer with people facing mental health challenges. “Crossing the Jordan” provides housing and support to recovering addicts. In the course of the conversations, we met these groups and believe they could and should play a stronger leadership role. We encourage other groups and leaders to include these organizations, and others like them, in integrated planning and solutions. • We recommend and encourage residents to engage and participate in the development of the city’s budget and support housing finance initiatives. • Many people look to both city and county government for leadership and funding for homeless initiatives, including the production of alternative and standard housing. •People want “outside the box” thinking and solutions in the use of government land, models from other areas, and the placement of affordable housing across all neighborhoods. •Some people are looking for rent subsidies and changes to regulations to support renters. Some believe government support detracts from individual success; others are looking at lobbying and advocacy to implement improved protections. •Informal, unregulated camps of homeless people are a risk both to the environment and the health of those who live in them. People encouraged the police, public works, health department and other government leaders to take both these risks seriously. • It’s obvious that the fires have redefined the number of homeless and at-risk people within the city. It is important to the community that government and agencies update the homeless census as soon as possible. • We recommend the City update the Housing Action Plan to reflect the reality of the impact of the fires. • We find the City’s Housing Action Plan, with a “Housing for All” strategy as a significant step in the right direction. We encourage the city, developers and consultants to hold planning meetings targeted to specific socio-economic groups, before designing and building housing. • The Housing First philosophy assumes an ample supply of various low-income housing options. Given the additional burden of housing our residents with a decreased housing stock, we support a strategy “on all fronts” with both temporary and permanent housing. • The fire destroyed approximately 5% of our housing stock. With a lot more people seeking housing and shelter, we all know a dire housing situation has been made worse. We recommend a reevaluation of the Housing First strategy. • We recommend developing designated temporary safe havens for auto and R.V. parking and safe camping dispersed throughout the city. • Over time, we encourage the development of high-density, infill development including alternative housing models. marginalized voices in any setting of priorities. • There may be a tendency to expedite recovery strategies without much public input. We encourage city and county leaders to beware of sacrificing inclusion for efficiency. • Services are important to people. Many people believe that homeless people don’t know what services are available. Some wished for more and/or different services, including a one-stop service center similar to the post-fire Local Assistance Center. and the frayed safety net. • There is a desire for more trained mental health workers to help people who are homeless, as well as for emotional help for individuals who support homeless people. • Many people know there are ways individuals can help, although some experience strong emotions when engaged in direct services. Support and teamwork during initial encounters and early relationship building is helpful. • Participants encouraged individuals, congregations, and neighborhood groups to interact in small teams in order to get to know and advocate for the unhoused people in their neighborhoods. • We support and encourage the city, county and service providers coming together in partnership to reach a common vision of the root causes of homelessness and to initiate a cross-sector effort to address them. • We call on the academic community to utilize their resources to identify effective strategies and evaluate the effectiveness of current practices. • We recognize that the impact of the “quality of life” policies and ordinances may perpetuate a cycle of homelessness. We believe that behaviors that constitute these offenses are mostly due to a lack of options. Until there are places where all people can sleep safely, use the bathroom, dispose of trash and lock up their belongings, laws criminalizing these behaviors are counterproductive and ineffective.